Spalted Sycamore end graft on quarter sawn Sycamore sides. Canadian Spruce top. Walnut back for Curly Redwood baritone. 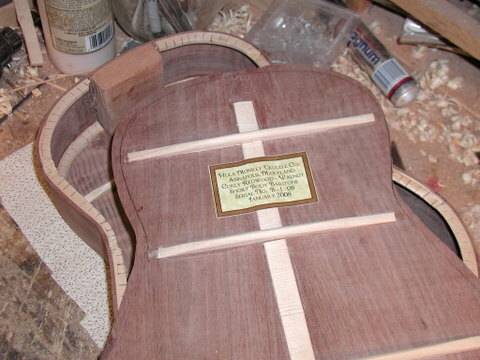 Unfortunately the Redwood top was so fragile that it broke during production. It was scrapped. 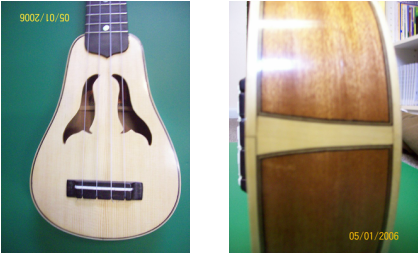 Above is the top of the third uke I built. It's made from some curly Redwood that is anomalously light in color. I have never seen any Redwood since that resembles it. 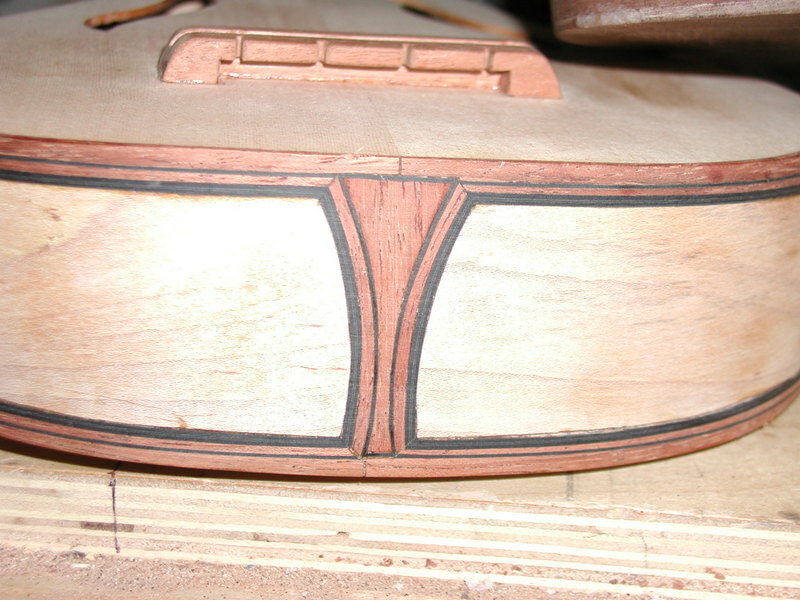 This picture shows the fan type bracing that I typically use on my instruments. It hadn't been carved at this point in its construction. 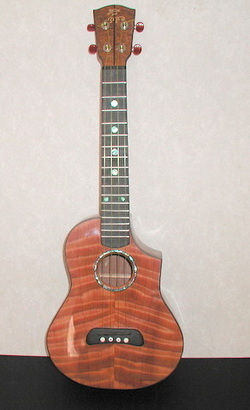 This is a Vita style uke I built for my friend Don Peyton. 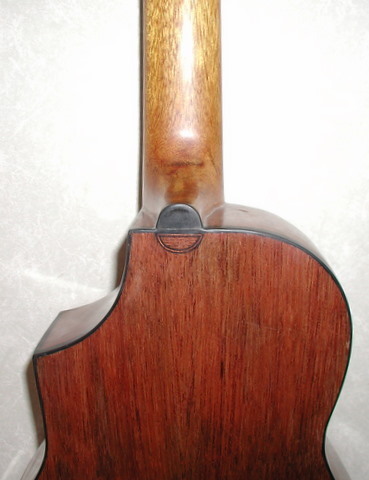 It features a Mahogany back and sides, Spruce top, Holly and Walnut binding. The fingerboard and bridge are Ebony, bone saddle and nut and MOP fret markers. The Mahogany was recycled from the football stadium in Baltimore. It was painted black when I got it. I started thinking about building instruments while lying on a couch ill. I had been lying there for a couple years at that point. I had a guitar that I was learning to play, nothing else to do, and I started examining it's construction. Having spent most of my life working as a craftsman in various mediums I decided that I could build a guitar and if I ever got better I was gonna do that. Eventually I did get better. I started working on obtaining the machinery required to build stringed instruments. I read every book on the subject that I could get my hands on, over and over. 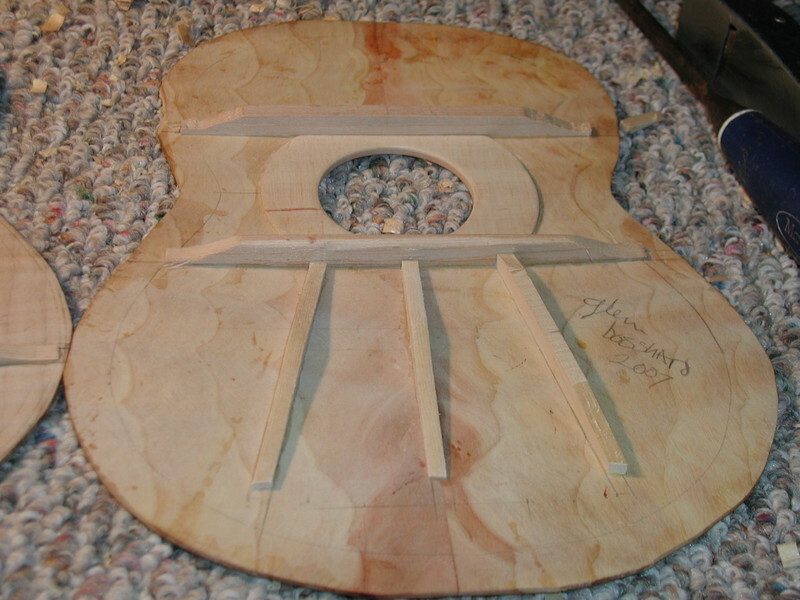 I started to build a guitar...3/4 size. I had a lot of success at the various steps of construction. My health crashed again and my life became very turbulent . I walked away from my shop and the half built guitar. As my life settled down my health didn't get a lot better. It was very disappointing. I met a fella who was playing an ukulele one day. He told me he repaired and built them and told me about another local guy who was building ukes. I was intrigued. I started looking at the internet and talking to these guys and I decided that I could build an ukulele. It was smaller than a guitar so naturally it would take less time. I thought that time was the thing I needed to be careful of in taking care of my illness. I was wrong on both counts. I started working on a uke. The one pictured above. Tenor seemed like a nice size, not too small, not too big. I made several mistakes and used frets that were for a guitar cuz that's what I had. I designed the bridge after a Gibson mustache bridge. Used the headstock shape from a Gibson L-5 guitar style. I really like this uke. Somehow it turned out looking and sounding very good. Emily (my youngest daughter - she's 18) learned on it and still plays it a lot. Half the time it lives in her bedroom. 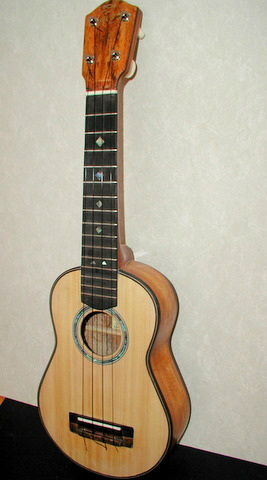 She uses a few different ukes that are hanging around the house and has become a very good uker. Next I built this little soprano for Dawn. It was supposed to be a Christmas present but it was still in pieces. I put it together with scotch tape and wrapped it up, Dawn loved it. However it took me several months to get back to work on it and complete it. It really is a pretty thing but the neck is too thick and slightly off. It doesn't have a lot of sound. It is mostly a wall hanger. 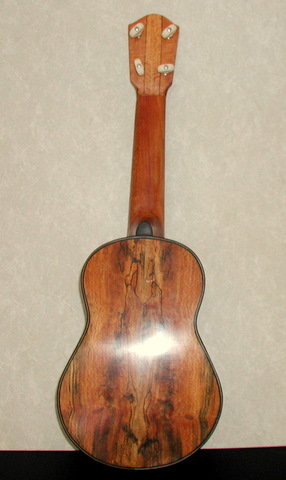 This is a cutaway tenor built from Curly Redwood & a very dense African Mahogany. There are a gazillion varieties of Mahogany and I was never really sure what type this was, I just know it was sold as African. It was very heavy which translated to having a very vibrant rich voice. 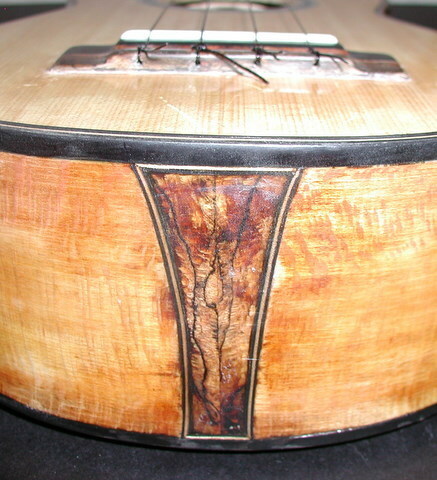 The bridge and fingerboard are Ebony inlay Paua Abalone shell. I used Ebony for the saddle and the nut as well. I was traveling and had hung this uke on a wall hanger before I left. When I came back a couple weeks later there was a crack down the back. I believe that it was knocked off the hanger and dropped on the hardwood floor. I had built it without a reinforcement strip on the back seam and the split follows it . It still plays well and sounds good. My son, Cameron who lives in Texas took a shine to it so he has it now.